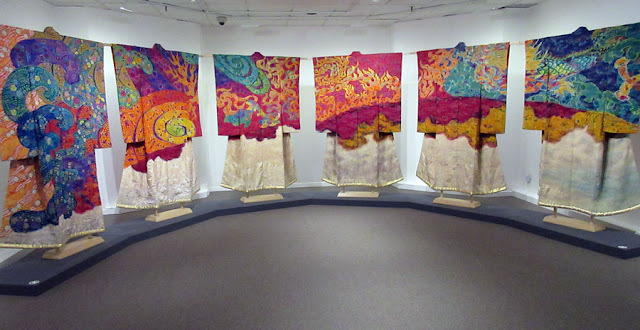 I went to see the Itchiku Kubota exhibition at the textile museum last weekend, not prepared for the awe I was to experience. 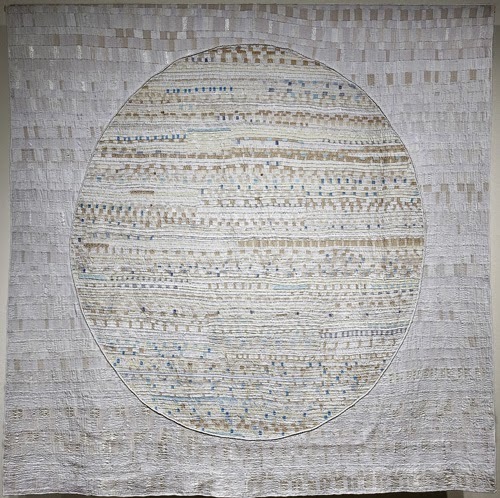 Itchiku Kubuta (1917 - 2003) apprenticed with a dyer who specialised in hand painting and resist dyeing when he was 14 years old and established his own studio 5 years later (age 19). The following year, while visiting a museum, he saw a fragment of Tsujigahana dyed kimono silk from the Maromachi period (16th century) that inspired him for the rest of his life. 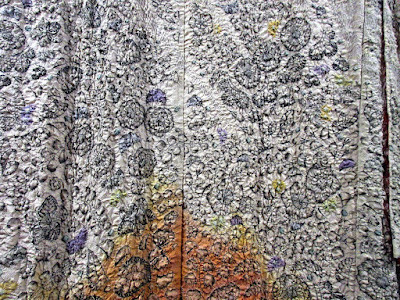 He devoted himself to reviving this ancient dyeing method, and eventually succeeded in 1981. 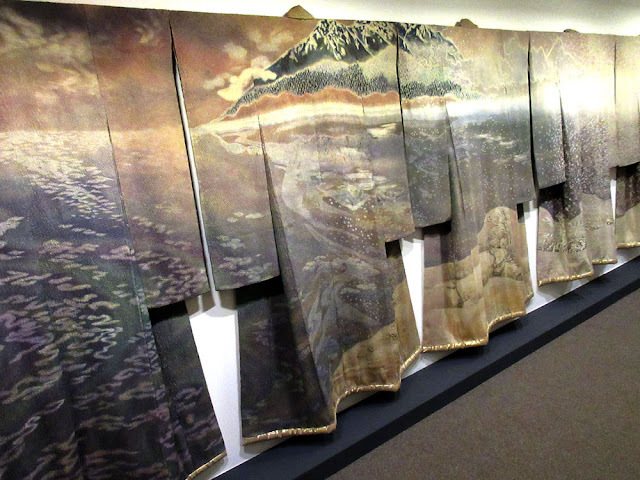 He wanted to create panoramic visions of the subtle but swift passage of time and nature through the seasons and decided to create 80 kimonos that would connect to each other, sleeve to sleeve as a continuous canvas. He was 63 years old when he began. 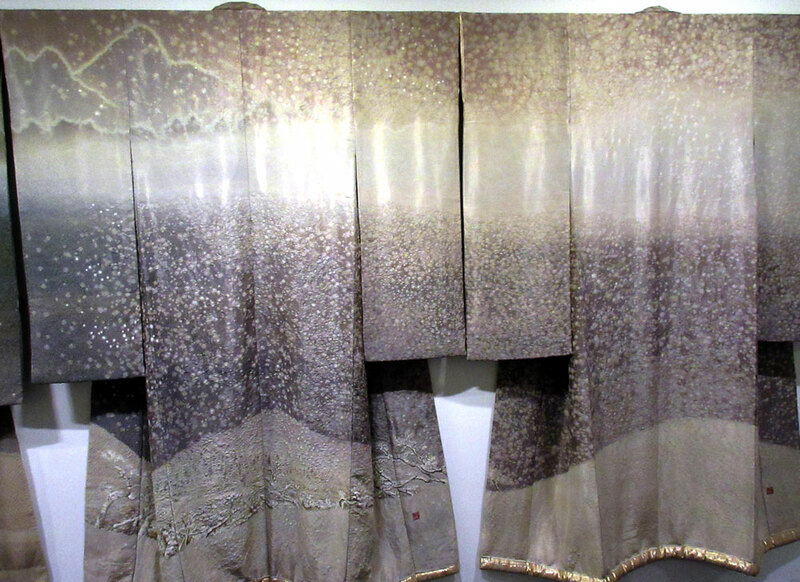 Itchiku Kubuta completed twenty-nine kimono for autumn and winter and five for the universe before he died at 86. An additional two for the universe were created by his assistants posthumously. It's his vision that I find awesome and humbling. He started his larger than life project with no hesitation about his own mortality....as if he truly felt that he had all the time in the world. His canvas references the human form in the kimono shapes, connecting to each other, arm to arm. Each is made one at a time over a lengthy period of time....going through multiple laborious steps. It is grand. They are sublime. There is a museum in Japan devoted to this man. 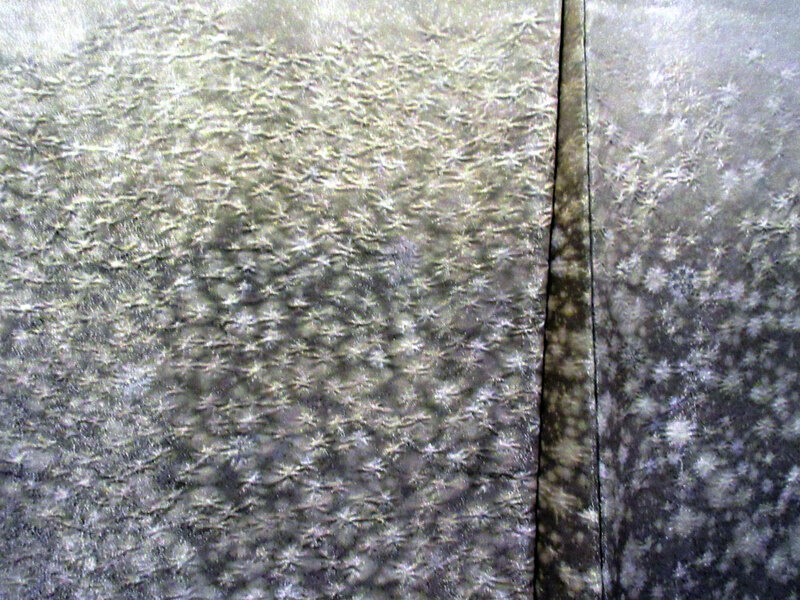 The website shows the Symphony of Light kimonos in a continuous line. click here. 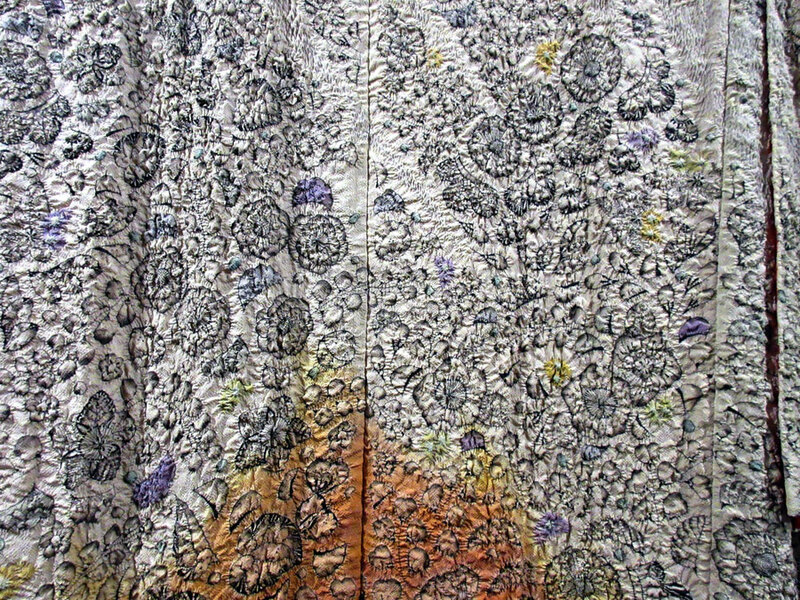 Kubota also created individual kimono. 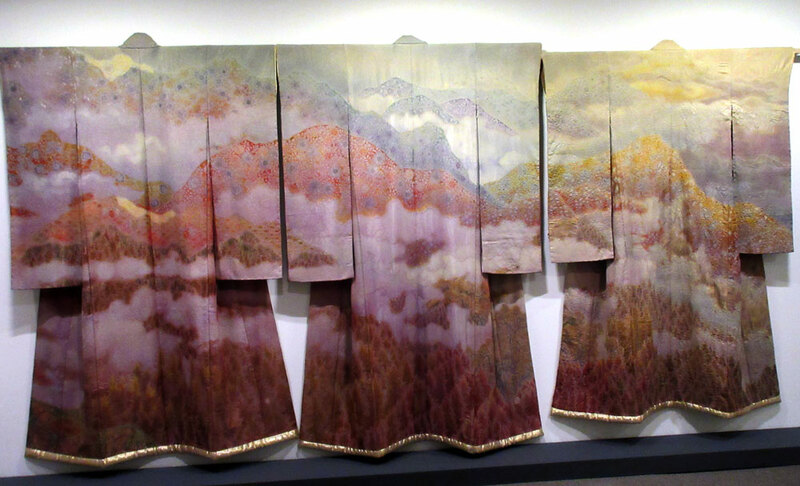 Three of his Mount Fuji kimonos were on display. "I don't like to say I have given my life to art. I prefer to say that art has given me my life"
Even online they're amazing. Remind me of generations as they hang together. Thank you so much for this. 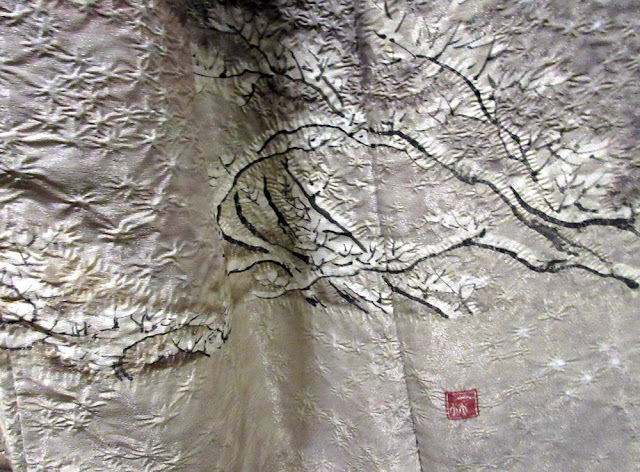 I spent part of my childhood in Japan, and moving through the link you provided brought back so many wonderful memories of where my love of silk, damask and brocade came from. Itchiku Kubuta was so generous to devote his life to his art. I have seen these in the Kubota Museum in Kawaguchiko, Japan. The works are stunning. The museum itself is set in lovely gardens which only adds to the experience. If the weather is clear you have an excellent view of Mt Fuji from the museum as well. Kawaguchiko is a day trip from Tokyo and is one of the popular places to see Mt Fuji. You can catch a little tourist bus at the station that runs around the lake and stops at the Museum or you could easily take a taxi from the station. 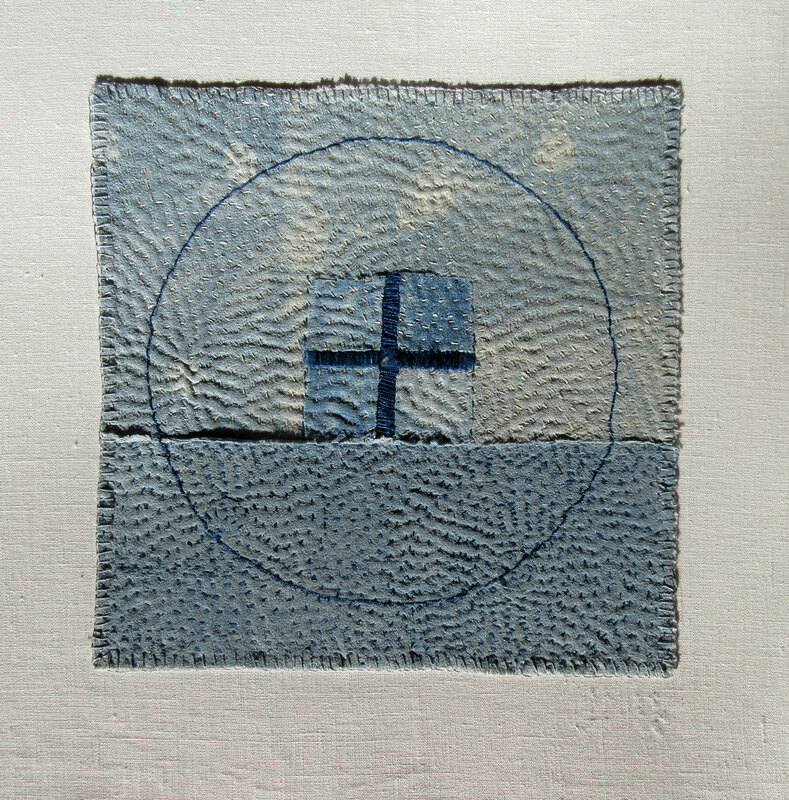 Masters of art don't think about mortality ,they only think about creation. No wonder you were in awe, Judy! As Mo Crow already said, they are exquisite. 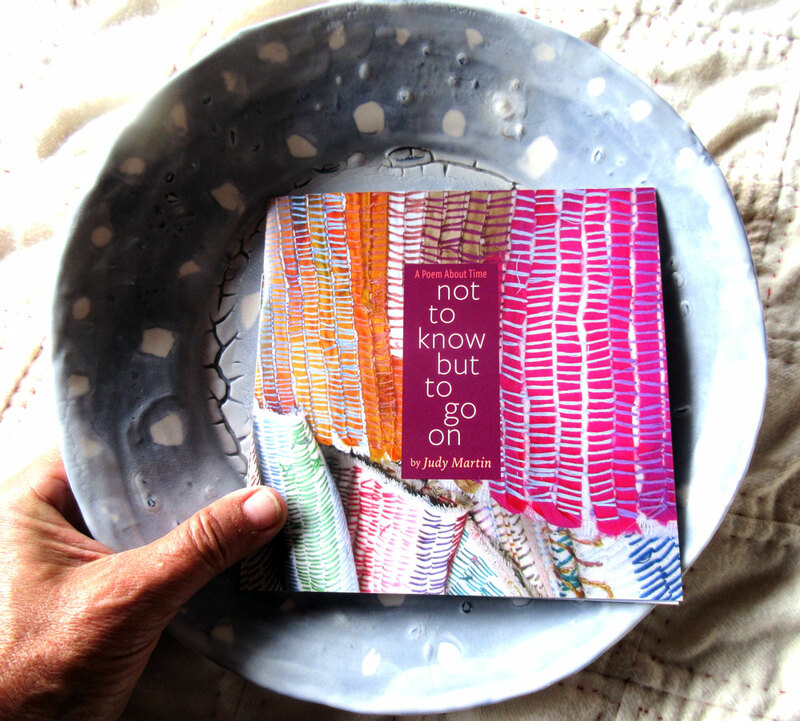 And that quote you ended with perfectly describes my relationship with art. Much love, dear appreciater and creator of beauty. These are incredible. Thank you. 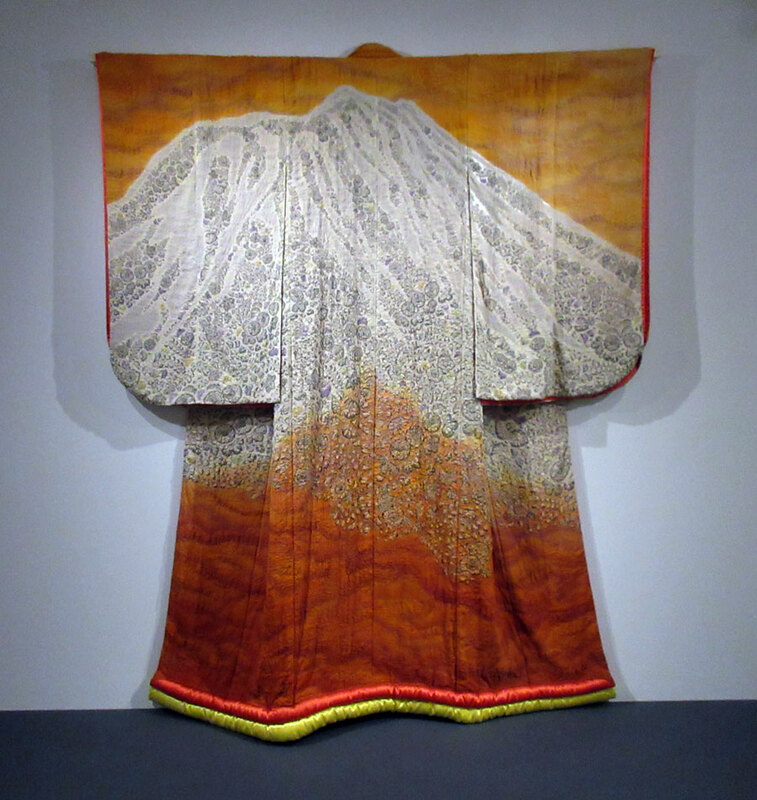 I saw a few pictures of Itchiku Kubuta's kimonos in Smithsonian magazine many years ago and was awestruck. Thank you for bringing him back into my mind again.